$135.99 & FREE Shipping on orders over $59. CO2 Tank (Aluminum) - 20 lb. It was a good deal for a multiple keg system. If I have two kegs that are already ready, I can force carbonate a new one. I upgraded my system to have this (two regulators) so I can leave my kegged beer at it's set pressure and do a closed transfer without messing with a regulator and forgetting to set it back. Is there a guard that fits over these gauges? BEST ANSWER: There is a gauge cover that fits the end 2 gauges only. I have this regulator, and want to change out the barbed ends that it comes with to threaded ends to fit my Blichmann BeerGun V2 fittings. Do you have these available? BEST ANSWER: Hi Chris - D1121 should be the part you are looking for. Quick shipping great regulator love the tank pressure gauge. I now know what is left in the tank. Simple set up with easy to read dials. No compaints! Well built and looks professional. 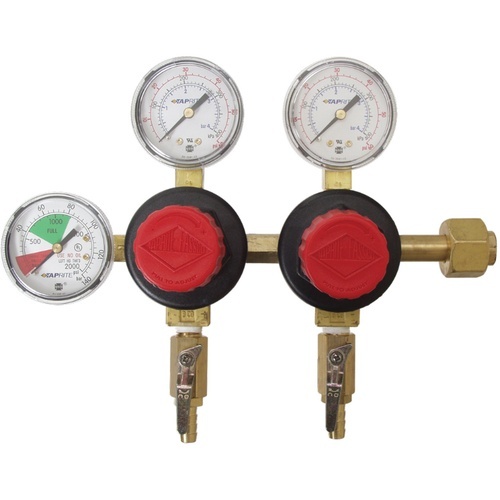 I ordered this regulator to replace an old regulator that won't hold pressure constantly. I have a single taprite, but need a dual valve version. This unit is great and precise. 11 psi means 11 psi. I highly recommend these regulators, don't get the cheap ones you will likely regret it and end up with one of these later on. I like the dual guages allowing me.to set different pressures for two kegs. Easy to read dials, large adjustment knobs & shut-off valves. Works really well to have 2 different pressures on 2 each keg. Very good gauge for the money. If you don't have this gauge set you should. Especially for the homebrewer. Nice to have the ability to run two seperate pressures. This comes in handy for carbonating and serving two different types of beer at one time. No problems this far. Would recommend to anyone. Great regulator with exact settings and control. I've had it hooked up now with two kegs and it has worked like a charm. I've had this hooked up for about a year. Works well, but my co2 tank empties too quickly. Twice I've found my tank empty with no warning. I've fully checked my system and found no leaks. I've concludrd the leak is coming from the regulator, which is frustrating for a new product. I will now need to rebuild these. For the price, that shouldn't happen. Now I can carbonate my Belgians to 19-20 psi at 45F while using the other gauge at 9 psi for serving. The only frustration I've had is that even when I only have one keg connected, my CO2 runs quicker than when I've attached a single body. Thankfully I've got one kicking around to plug on when I've only got one keg in the fridge. Otherwise, does great at carbonating and pouring 2 kegs at the same time. Sounds like a leak: paste soapy water around all joints. Check everything, including the hoses you used on the old regulator (because the hoses could be oriented/stressed differently which might hide that there is a leak). great set of regulators. I can force carb two different beers. downside, easy to tip CO2 bottle with these. Bought this to replace my old regulator that had persisted in leaking after a rebuild. I much prefer the design on this model - large knobs make it easy to set-and-forget the pressure. It is significantly lighter than my old model as well (though still solidly built). I purchased this to have two gas pressure settings for my beers: higher for forced carbonation of my kegs, and lower for serving. Does the job very well and I've had no issues (no leaks, etc.) whatsoever with the product. Bought this for my Keezer setup. Have had zero problems with it so far. Good company name. Fair price.